Mood Support : Niacin by Seeking Health may support normal mood regulation by relieving any symptoms that could be related to a deficiency of this important vitamin. Furthermore, your body cannot store niacin, so you need adequate intake of this important vitamin every day. Serotonin : One of the building blocks of serotonin is the amino acid tryptophan, and one of the building blocks of tryptophan is Niacin. Tryptophan also helps the body supply itself with Niacin. If tryptophan is divided between serotonin production and niacin production, serotonin production is likely to be inadequate. Supplemental niacin and tryptophan can be beneficial for elevated moods. Enhanced Mood : The B vitamin Niacin is important for proper functioning of all cells, including the cells of the brain and nervous system. Circulation : Niacin promotes good cholesterol HDL or high-density lipoprotein levels. Detoxification : Niacin has the well-known effect of causing "vasodilation", often called the niacin flush, which is an opening of the small blood vessels, the capillaries, for proper blood flow. These are the blood vessels which are of most value in reaching fatty tissues. In this way the toxins which are stored in these fatty tissues can be removed, into the bloodstream, and processed out of the body. Healthy Skin : Niacin supports healthy skin. Niacin also helps the skin with moisture retention and aids skin’s elasticity and tone. You can use supplements but to enhance the benefits of niacin on your skin, eat fish, meats, grains and green vegetables or other foods high in vitamin B3. Osteoarthritis : Niacin has been found to support joint mobility. Taking vitamin B3 has also shown to support healthy cartilage. Suggested Usage: As a dietary supplement, take 1 tablet daily, preferably with meals. This extra high potency tablet should be taken under doctor's supervision. 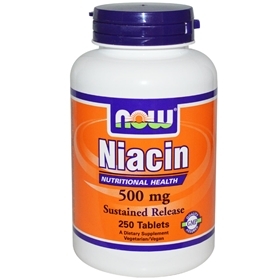 Niacin often causes itching or flushing but this sustained release tablet minimizes those problems. Consider taking this product in combination with NOW® B-50 Complex, D-Ribose and Sytrinol®.